President Barack Obama on Friday forcefully denied deliberately misleading Americans about the deadly attack on the U.S. Consulate in the Libyan city of Benghazi, telling radio host Michael Smerconish, "I've always been straight with the American people." Asked whether the administration's shifting explanation for the September 11 strike reflected the intelligence he was receiving, Obama replied: "What's true is that the intelligence was coming in and evolving as more information came up. "And what is true," he continued, "...This is something that the American people can take to the bank—is that my administration plays this stuff straight. We don't play politics when it comes to American national security," the president said. "As information came in we gave it to the American people. And as we got new information, we gave that to the American people." 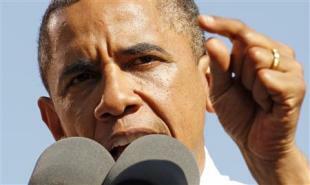 Questions have arisen about Obama's response to the Arab Spring occurring in countries across the broader Middle East. State Department officials have acknowledged turning down requests for more security in Libya. And Republicans have questioned the president's truthfulness after the administration spent days, they say, blaming the assault on reaction to an Internet film that ridicules Islam. Yahoo News reported in late September that American officials had concluded on Day One that terrorists were behind the siege. But The Wall Street Journal reported on Monday that Obama's presidential daily brief from the CIA tied the assault to a spontaneous protest linked to the video—despite intelligence contradicting that scenario. "But we're going to find out exactly what happened," he said. "Ultimately, though, any time there is a death of an American overseas, I want to find out what happened, because my most important job as president is keeping the American people safe." He also said he takes "full responsibility" for the circumstances in the attack, in which Ambassador Chris Stevens and three other Americans were killed. The suspects have not been publicly or conclusively identified, though Egyptian officials say a man suspected to have been involved was killed on Wednesday in a shootout in the capital, Cairo. Obama harshly criticized Romney for his response to the crisis. The former Massachusetts governor, in his first statement, implied the administration had sided with the attackers. Smerconish asked whether Romney's criticisms of the changing explanation for the attack were "disingenuous," given he started getting intelligence briefings himself (though they only began roughly one week later, on September 17). "He certainly understood that when our diplomats are still under fire—not just in Benghazi but around the world, in Cairo, in Pakistan, etc.—that if you aspire to be commander in chief you don't release a political press release.," Obama said. "You don't have a political press conference that tries to take advantage of that opportunity that is so reckless that even members of your own party criticize you for it." The president said a top priority was making sure that Americans are kept informed on matters of national security "within the constraints of classified information that would endanger folks in the field, so that people can have confidence that their president and everybody involved in national security is working for them." Asked whether Romney had toned down his sharp criticisms on Libya because of what he learned in intelligence briefings, Obama said he doubted his rival was "constrained" by facts. "I just don't think that that was getting a lot of political traction for them," he said. Obama was not asked about, and did not bring up, a report by Fox News Channel that American officials repeatedly asked for military help during the assault but were rebuffed by CIA higher-ups. A spokesman for the president's National Security Council did not acknowledge a request for comment on that report. But Defense Secretary Leon Panetta made a comment on Thursday about "Monday morning quarterbacking," saying a clear picture of events on the ground leading up to the attack has not yet emerged.